There is no denying, it is an exciting time to eat in Dublin at the moment. New restaurants are popping up all over the city and in less obvious corners with the rise of the more casual neighbourhood eatery. The neo-bistro movement born in Paris’ 11th arrondisement seems to have caught on here, with ambitious young chefs putting their all into opening up their own properties focusing on delivering pared back, high quality food in relaxed surroundings. Think Bastible and Craft, unpretentious gems housed in unlikely properties in Leonard’s Corner and Harold’s Cross. Milltown, a suburban riverside corner of D6, can now lay claim to it’s own neighbourhood restaurant with the opening of Ember last week. Chef proprietor Greg O’Mahoney has had a decorated career thus far, counting Chapter One, L’Ecrivain and Pichet among his Dublin exploits as well as lesser known destinations of Gregory’s Garden and Milesian in South Kerry’s picturesque coastal village of Castlegregory. I would imagine the inspiration for this latest venture however comes from a spell in food Mecca San Sebastian, with Ember being a nod to the smoldering coals of the wood-fired oven he has installed here, beloved in Basque cuisine for imparting unrivaled smokey flavour. On a freezing Tuesday evening after opening weekend, John and I were completely drawn to the inviting glow of Ember, and admiring the seriously slick decor our decision to pop in for an early dinner was vindicated. Pared back, this is not. Opulent scarlet leather booths and Instagram worthy walnut tables surround a stool lined marble top bar that wouldn’t be out of place in the most chic of city eateries. Although early, a steady stream of locals curious to sample the newest addition to the area began to trickle in and by 7.30 the space was entirely packed – a rarity on a Tuesday indeed! The a la carte menu presented an array of temptations including Scallops a la Plancha with Chorizo, Apple and Dillisk (€15) and Wicklow Venison with Blackberries and Chocolate Jus (€26), clear indications of the contemporary European feel of Ember’s cuisine. As a quick and casual post work dinner was on the cards, we decided to take advantage of the Early Bird option of 2 courses for €22 or three for €27, which offered three options for each course. 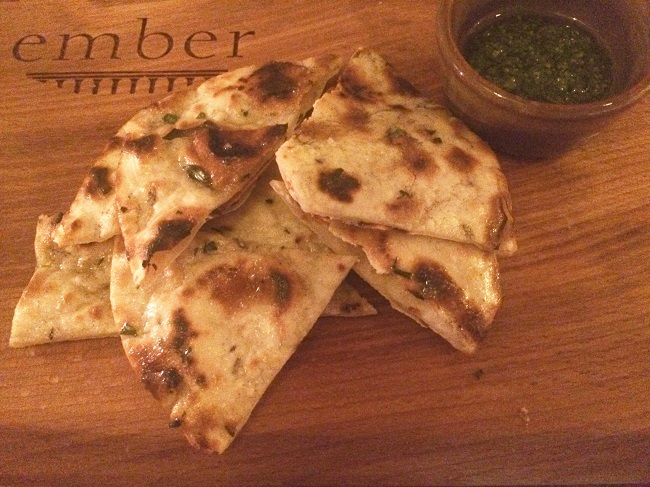 I rarely comment on the quality of the bread offered but I have to note on this occasion that shards of house-made, wood-fired flatbread were the perfect introduction the charms of the oven Ember has been built around. Served with a garlic and herb oil, John was very pleased to devour most of what felt more like a pre-starter, packed with flavour and promise for the courses ahead. I couldn’t help but opt to start with Chestnut Velouté, Buttermilk Potato and Smoked Chicken, always one to jump at the opportunity to enjoy festive chestnuts in all guises. My starter arrived with an element of ceremony, with a stream of silky velouté quickly poured over a quenelle of smokey pulled chicken, a shard of tempting crispy chicken skin and cloud of buttermilk potato puree. 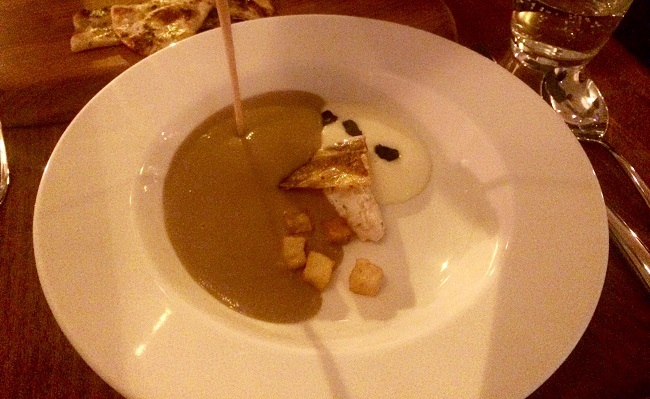 Spiked with the tang of buttermilk and addictive oak-scented chicken skin, how a shallow pool of velouté could house such depth of earthy flavour is beyond me – this was a truly enjoyable dish on a cold winter’s evening. John advised opting for a glass of citrus-scented Protos Verdejo (€8.50) to cut through the richness and this pairing worked a treat. 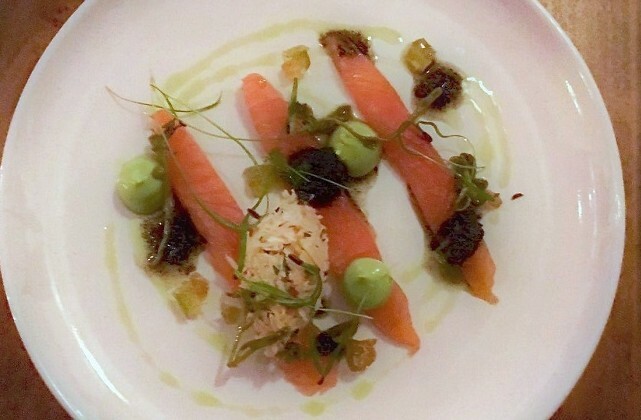 John opted for a lighter starter of House Cured and Smoked Salmon, Avocado, Caper Flowers and Black Olives a beautifully plated dish I immediately eyed up. Having bartered a spoon or two of my velouté for a taste I can confirm the subtle smokiness of thickly sliced house cured salmon played nicely with drops of cool, creamy avocado and unexpected fig and mustard jelly added a pop of welcome sweetness. Flaked fresh crab and black olive added salinity to a well balanced and more-ish dish which was well matched to the gooseberry notes of Domaine Horgelus Colombard Sauvignon Blanc(€8). While our starters were elegant and dainty, both main courses aimed to demonstrate just how much of an impact wood-fired cooking can have on flavour of the simplest of ingredients. 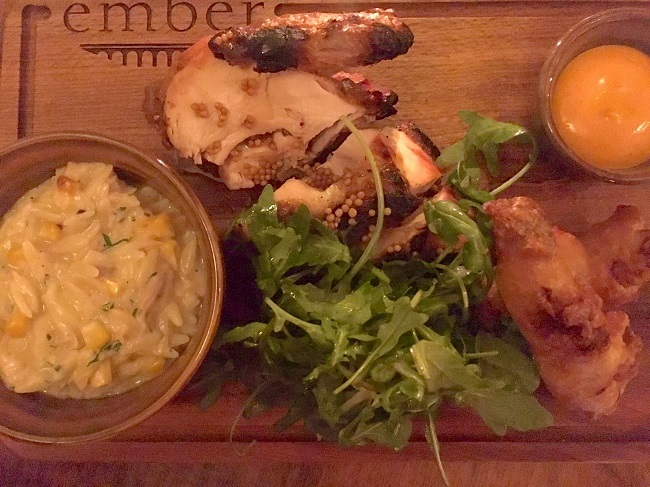 We chose to share the Irish Free Range Chicken Three Ways, House Aioli, Orzo & Corn, Madeira & Pickled Mustard Seed which was a generous portion of charred leg and breast, cooked on the bone with delicious skin intact, with a drizzle of madeira jus and homemade paprika aioli for dunking. Buttermilk fried chicken thigh was a great way to utilise the tastiest part of the bird, but for my liking the batter could have been a little thinner. A fricasée-like creamy orzo was slow cooked in rich chicken stock specked with thigh meat to round out the trio and was a comforting little bowl of goodness. 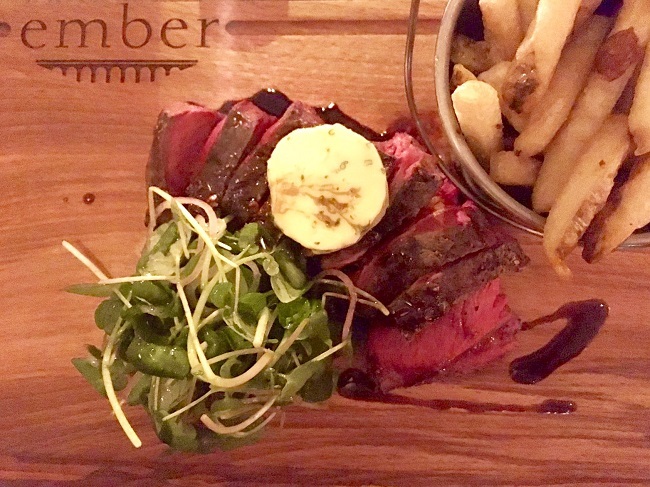 Both mains were served on customised “Ember” embossed boards, the second of which was adorned with blushing slices of delicious Feather Blade Steak, cooked perfectly rare as requested. Topped with a melting mound of intensely garlicky butter (you can never have too much, garlic or butter) this char-grilled feast was a carnivore’s dream. A perfect steak needed little more than watercress tossed with lightly pickled red onions and rustic skinny fries so tasty I suspect beef dripping was to thank. I love seeing the cheaper, usually more flavourful cuts of beef, expertly cooked, appearing on menus – feather blade just begs to be flame cooked and Ember nailed it. John is a cheese over dessert kind of guy, which is just fine with me as it means I can have my cake (or Fondant, as it were) and eat it, largely unimpeded by requests to share. 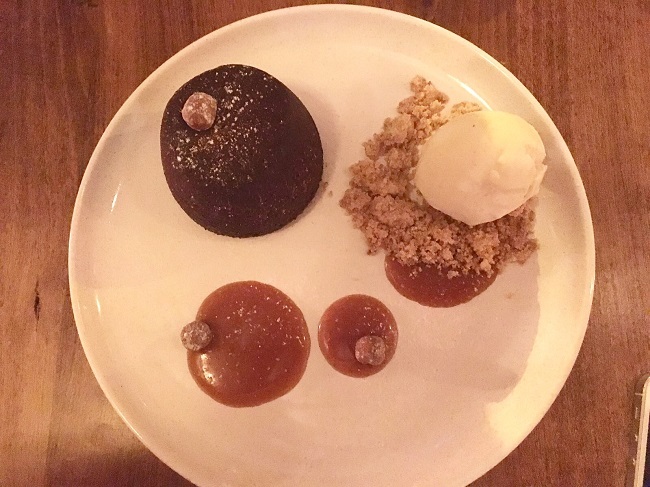 This was just as well, as 70% Chocolate Fondant with Salt Caramel Ice Cream was realistically going nowhere but my mouth as soon as I spotted it wobble before oozing a perfectly molten centre. By the time John got a lone bite there was the faint aroma of long lost salted caramel, after I had my way with the butterscotch sauce and salt-spiked ice cream. Needless to say I was a happy lady indeed, the ever popular #yolkporn has nothing on the pleasure of cutting into a flawless fondant. Luckily, my dining partner was more amenable to the art of sharing. He quaffed a glass of Chateau Haute Rian Cadillac 2012, the honeysuckle sweetness of which, he said, matched the saltiness of the ever delicious Cashel Blue perfectly. Galway Goat Farm goat’s cheese and vintage cheddar from Cork were both enjoyed with house-made rye cracker shards, quince jelly and caramelised red onions but we easily agreed on the star of the show. A prized slab of an unctuous yellow rind unpasteurised French cow’s milk soft cheese, obnoxiously flavourful, I would guess was Epoisses, one of my favourite Burgundian beauties. I still regret not fighting for more of it. By the time we had finished, Ember was alight with happy patrons, many of whom had popped their heads in the door for a look only to be seduced into staying to sample the new kid on the block. A Tuesday night had more a weekend vibe and the arrival of this new eatery to Milltown was clearly welcomed heartily. 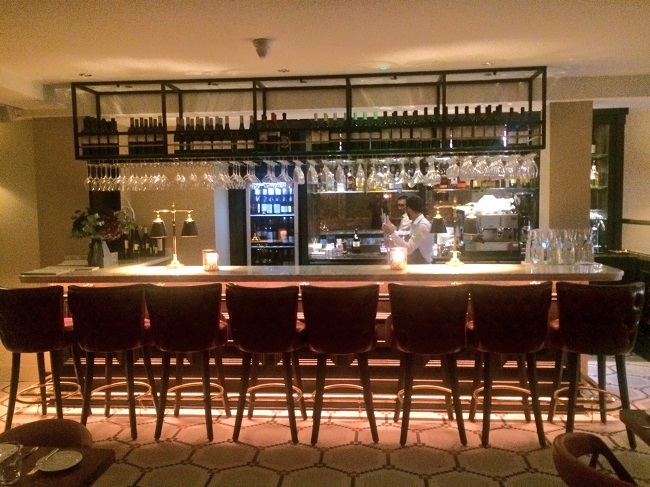 John and I agreed that the ambience and surroundings alone made Ember a tempting option, well matched with a broad spectrum of inviting dishes, which I’m sure will continue to evolve as Greg and Co get into the swing of things. I would love to see more of a nod to provenance of ingredients on the menu, as it was clear high quality produce was utlised throughout our meal. 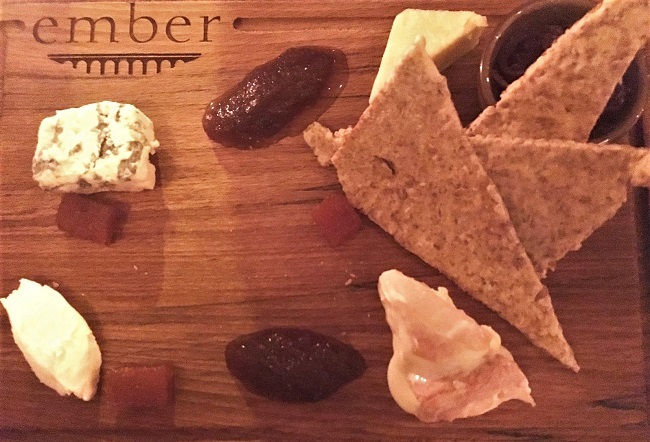 While we stuck to some rustic early bird options, it was clear that Greg confidently deals in both the realm of casual fayre and delicately plated, refined dishes and a return for a more relaxed dinner once Ember has bedded in to sample these is on the cards. Ember strikes a finely tuned balance which will appeal to everybody, whether it is a quick weeknight dinner or a leisurely weekend treat meal. Considering Ember had been open just three nights when we visited, it was a positive and promising start indeed. I’ll be back to sample that venison….and a chocolate fondant (or two). Our bill, excluding service, for three courses and a glass of wine each came to €76.